Here at Veranda Beach we're all about getting away from it all! And what better way to do that than to explore this little piece of lakeside paradise on roads far less traveled on a mode of transport far more relaxing? Using Veranda Beach as your home base, hop on your bike then hit the back roads linking our hill towns and lake district. Along the way, discover the spectacular scenery of the Okanogan Valley - vineyards, orchards, rivers and lakes await. 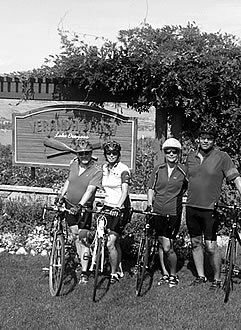 Veranda Beach is in the perfect location for stress free road biking, as more and more cyclists are discovering, including the annual group of 200+ who ride through our Northern Okanogan for Robb's Ride. Robb's Riders will tell you of scenic similarities to past European cycling tours and a sparsely traveled route that makes for a wonderfully relaxing outing. We look forward to welcoming many more cyclists to Veranda Beach as the Northern Okanogan’s reputation as a cycling destination grows!